Mmmmm pumpkin, it just screams fall, and it so celebrates Halloween!!! 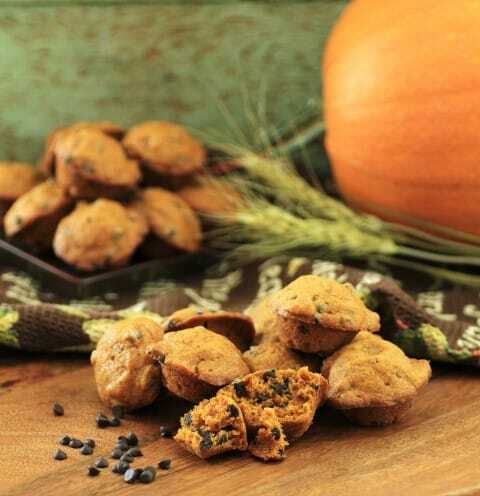 I love the combination of pumpkin and chocolate together with all the wonderful earthy spices. Also my favorite is to make little muffins. Just a perfect size for a snack or a couple of them for breakfast. You can whip up these little gems quickly and make all autumn long. I love the little mini chocolate chips, just right for a little muffin!! You will love these, ENJOY!!! A delicious mini muffin with all the flavors of fall!! Preheat oven to 350F. Spray a mini muffin pan with cooking spray and set aside. With a standup mixer, cream the butter and sugar together add the eggs one at a time, beating well after each. Whisk together the dry ingredients and add to the butter mixture. Mix well. Add the pumpkin and vanilla. Mix well. Fold in the chocolate chips. Fill the mini muffin pan and bake for 15-18 min. Cool for 5 min. and then pop the muffins out to cool completely. Totally cute! I love pumpkin muffins with chocolate chips! Yum!